Do you pay your kids to do chores? That's what personal finance experts Dave Ramsey and Suze Orman recommend. Or, maybe you expect chores to be completed without pay. After all, nobody pays you to make your bed, right? That’s how parenting experts Michele Borba and Dr. Joanne Stern feel. Or, maybe you like the hybrid approach: basic chores are expected, but extra chores pay a commission, like Frugal Dad recommends. Regardless of which model best fits your family, it makes sense to use a chore chart to set clear, explicit expectations about what should be done when and by whom. Your kids are online. They’re comfortable with technology — maybe more so than you. Everyone knows what’s due and when. Anyone in the family can get at their responsibilities from anywhere — even on the go via mobile phone. Still hearing excuses? Set up some automatic reminders. 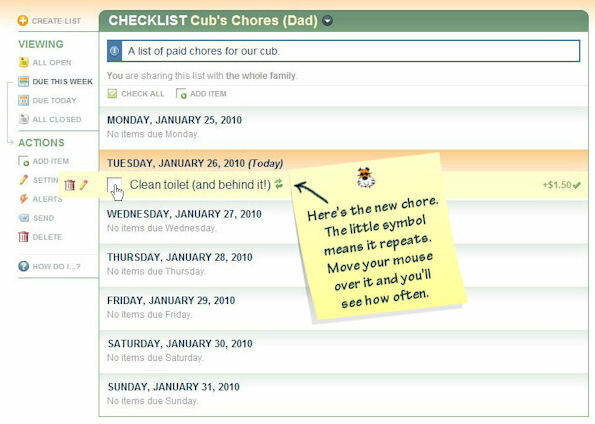 Kids don’t have to come to the chore chart anymore — the chore chart comes to them. Can’t you just see your tweens or teens rolling their eyes already? It’s easier than using paper. 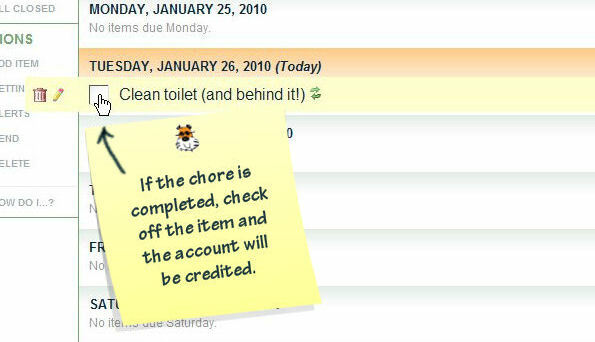 It’s easy to set up recurring chores once and have them appear automatically thereafter. 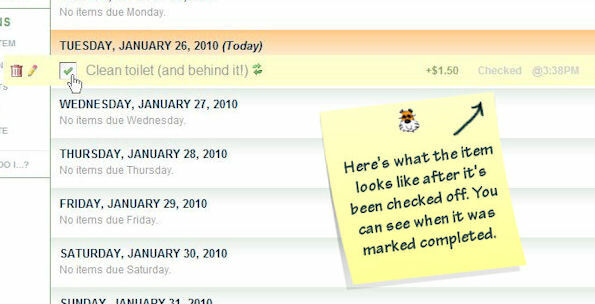 It’s easy to automatically tally up commissions for completed chores and credit the proper accounts in the Bank of Mom/Dad. It’s easy to change things as your kids mature. No more re-writing history. There’s an automatic historical record which comes in handy during subsequent “negotiating” with the kids. I’ll confess that I do enjoy showing them how much money they could have made if they had followed through a bit more consistently. 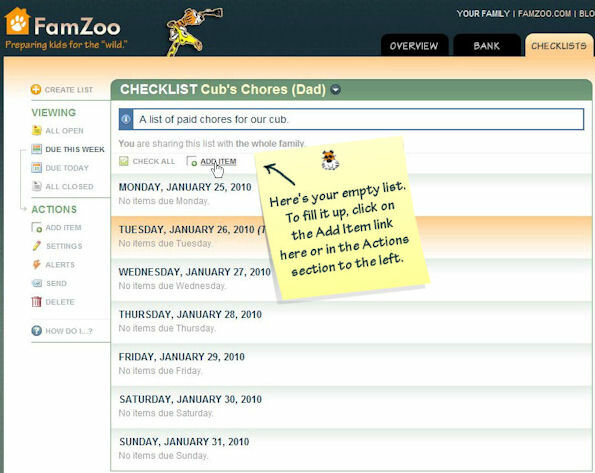 Step 1: Sign into your FamZoo account and click on the Checklist tab. 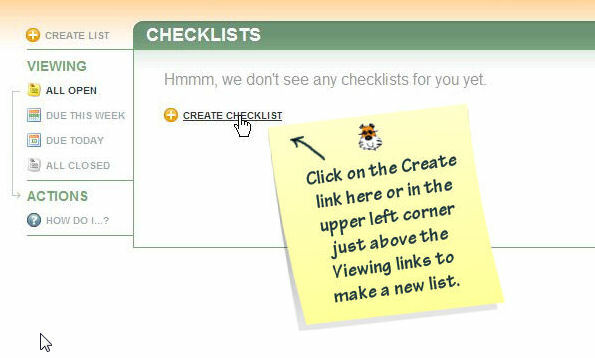 Step 2: Click on a Create link to start creating your chore chart. Step 3: Give your chore chart a name and fill in some other general settings. 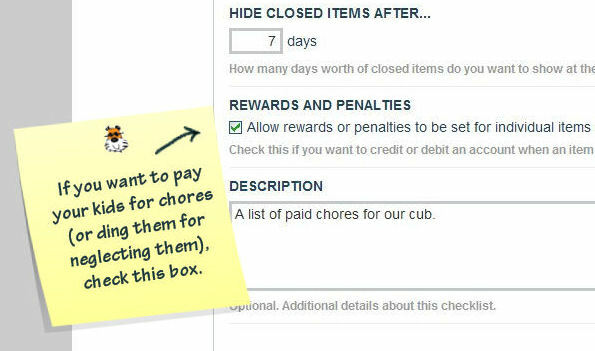 Step 4: If you want to pay your kids for chores (or ding them for neglecting them), check the Rewards & Penalties box. 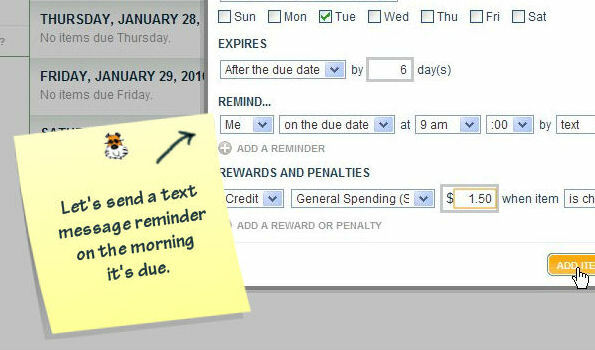 Step 5: Click an Add Item link to start adding tasks to your chore chart. Step 6: Fill in the fields for your each new task. 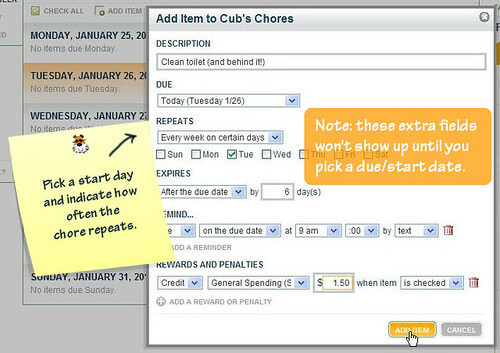 Step 7: If it’s a recurring chore, pick a start day (the Due field) and select options for how often it repeats. 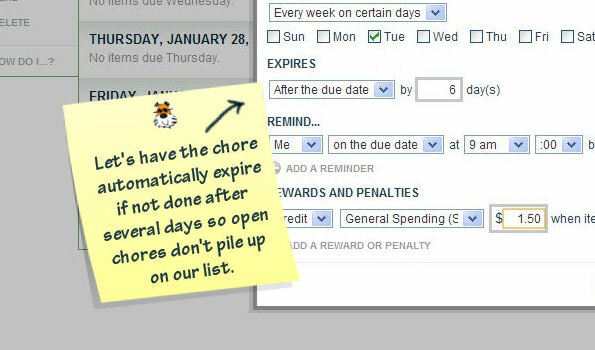 Step 8: Set an “expiration date” on your chore so unfinished chores don’t clutter up your list. Step 9: If you’d really like to annoy your kid, set up a text message reminder for the chore. Step 10: If you’re going the pay-for-chores or the hybrid route, indicate how much should be paid to which account when this chore is completed. You can add multiple entries here if you’d like to split between multiple accounts — like spending, saving, and giving. Step 11: See what your new chore looks like on the chore chart. 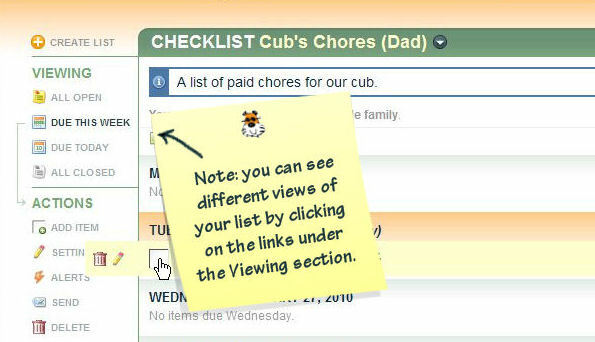 Step 12: Play around with different views of your chore chart by clicking on the viewing links. Step 13: Try checking off a chore by clicking on the check box. Step 15: Hop over to the transactions page for an account in your virtual family bank to confirm that the commission has been paid. Got questions? Don’t hesitate to ask. We’re always delighted to help. Is there a way to put the items in a checklist in a certain order? We would like to prioritize the items and also indicate which time of the day they are to be done. Unfortunately, reordering checklist items within the same day is currently on our ToDo list, so you'll need to enter the items in the order desired (or delete and recreate accordingly). We've been concentrating our development efforts on our new prepaid card integration (see famzoo.com/cardfaqs), so I don't have a firm date for delivering the reorder support just yet. As for expected time of day, I recommend putting that in the description like "8:00AM Feed Dog" - note that you can set reminders at the granularity of 15 min, so you could send a reminder at say 7:45AM. 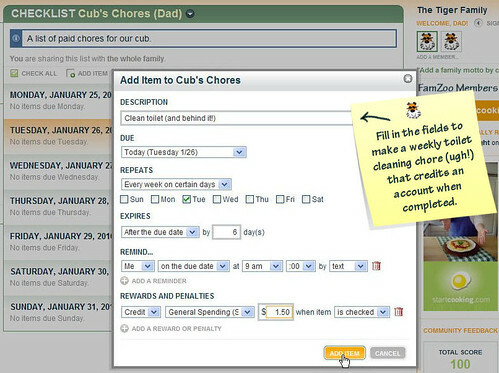 After a chore is checked off, when would that chore amount become available for the Child's card for spending? Dan, if the chore reward is associated directly with the spending card account, it will be available as soon as the chore is checked off. 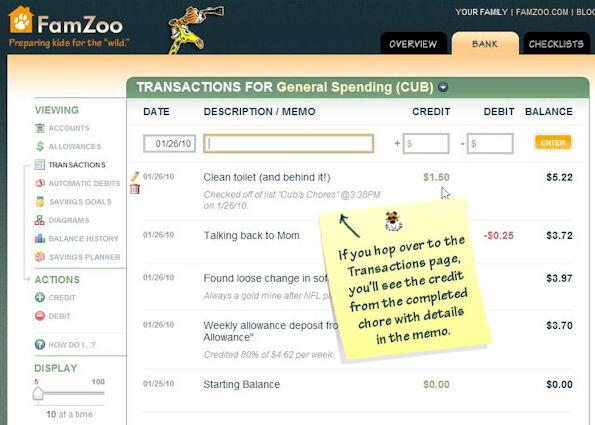 If you want to accumulate the chore rewards for a "paycheck cycle" and deliver them to the card at the end of the "pay period", you could create a separate IOU account, associate the chore rewards with that IOU account, accumulate the rewards there for the pay period, and then transfer the IOU account balance to the spending card on "pay day". If you need additional help, just click on the Contact Us link in the app(lication). 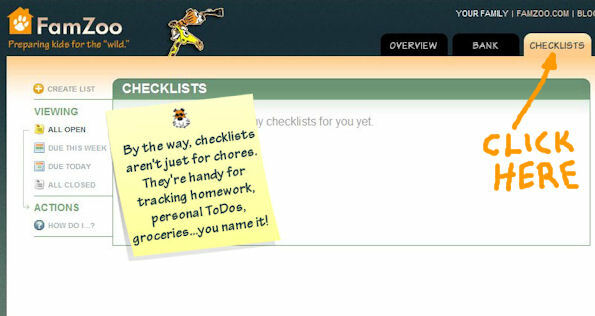 In the app, the chore lists can be edited, added to, and deleted by the kids! Am I doing something wrong here or is there a way to prevent list editing by children? If the list is marked as shared with the kids, they can indeed edit its contents (except for reward and penalty amounts). This is useful for certain scenarios - like shared gift and grocery lists, but definitely has downsides in the chore scenario with younger kids, so we plan to add more protection options in the future. In the meantime, parents often set up checklist alerts to monitor shenanigans and let the kids know there will be repercussions - financial or otherwise - for any messing around. Kind of a trust-but-verify gig. Yes, a chore can be assigned for every other week by selecting "Weekly on the following days" for the Repeats setting on the repeating item. At that point, an "Every N Week(s)" control will appear and you can select 2. Is it possible to copy a checklist? I have a chore list for each of my 4 kids and I don't want to have to recreate it 4 times. Thanks. Hi Joe, unfortunately, we don't have a copy-checklist capability just yet. (The implementation has a few subtleties because kids may not have the exact same accounts in place for duplicating rewards and penalties, so that's why it has remained on the back burner for a while.) Apologies for the inconvenience. Is it only possible to assign a single chore to a single child? 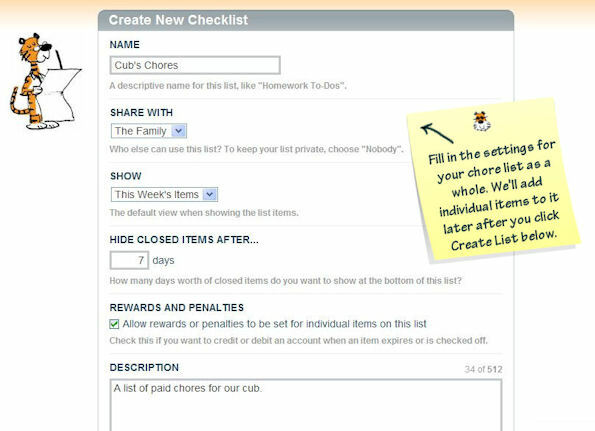 Or would one be able to make the chore available to any/all of the children, and then whoever does it gets the reward? who checks off the chore as done? the kid or the parent? can the kid check it as done, but the money doesn't transfer until the parent verifies? Stacy, the amount specified for the reward (Step 10) will be applied to the designated account(s) each time the chore is checked off. So, if I understand your question correctly, you'll want to divide the total desired weekly amount by the number of recurrences per week. E.g., if emptying trash two times a week is worth $1.00 each week, set the reward on the Mon/Thu repeating item to be worth $0.50.